FRIENDS of Great Salt Lake will award the 2019 Doyle W. Stephens Scholarship in the Graduate Division to Clint Carney, Ph.D. Student in Water Policy and Human Dimensions at the Quinney School of Natural Resources at Utah State University. Carney's proposal, Bringing Great Salt Lake into Utah's Water Reallocation Conversation, examines fundamental elements necessary for implementaion of a water bank system in Utah. FRIENDS of Great Salt Lake will award the 2019 Doyle W. Stephens Scholarship in the Undergraduate Division to Chloe Fender of Westminster College. Fender's proposal, Snowmelt Contaminent Pulses in the Wasatch Mountains, seeks to determine locally relevant contaminants entering Great Salt Lake ecosystems via snowmelt. The schlorships will be presented on May 15, 2019 from 6:30-8:30 at the Gore Auditorium at Westminster College. We hope you'll join us to congratulate Clint Carney and Chloe Fender and learn more about their vital research. Special thanks to our 2019 Doyle W. Stephens Scholarship judges for their thoughtful review of the applications. Thanks to our 2019 Doyle W. Stephens sponsors and donors, who make this scholarship possible. Mark your calendars for these fun events coming up at Antelope Island State Park over the next few months! From astronomy to history to cycling, these are all great opportunities to visit Great Salt Lake and learn something new. Most people hike Antelope Island during the day but there are lots of critters out at night. Join the park naturalist for a hike by the full moon light and learn about the nocturnal wildlife of Antelope Island. Meet at the Dooley Knob (the same as Frary Peak) trailhead at 8:15 pm. We will be gaining about 800 feet of elevation in 1.5 miles. This hike is 3 miles total. Fielding Garr Ranch Tours: "Life and Death at Fielding Garr Ranch"
Antelope Island was used for 133 years as ranch land. There are countless stories: happy, sad, and just plain weird. Walk the grounds with the Fielding Garr Ranch Manager at 11:00, 1:00, and 4:00 to hear some of the every day things and unusual events where they happened. For more information, e-mail caldrich@utah.gov. To celebrate Historic Preservation Month, Fielding Garr Ranch will have a special Junior Ranger self guide--only available this month. Why is Fielding Garr Ranch worth preserving? Take on the role of a historian to analyze maps, look at pictures, read people's mail, and inspect buildings close-up to find out for yourself! Due to the number of people at the ranch for Cowboy Legends, this will not be available May 24-26. Only a limited number of guides will be printed. For more information, e-mail caldrich@utah.gov. USA Cycling will be holding the 2019 State Championship road races through most of the day. Event set up and parking will take place within the Marina. The start/finish line will be set up about 2 miles south along the East Side/Ranch Road. Park Impacts: No park roads or areas will be closed for this event. Expect heavy traffic and pedestrian use in the marina. Expect additional cyclists along park roads. Join park staff and members of Ogden Astronomical Society for a public star party in White Rock Bay. Solar viewing begins at 6:00 pm followed by deep space viewing after dark. Telescopes are provided by members of the astronomical society and will be focused on several deep space objects such as nebulae, star clusters and galaxies. Please ensure all flashlights have red filters. No reservation required. Park entrance fees apply. For more information, contact wendywilson@utah.gov. Come have 133 years worth of fun at Fielding Garr Ranch! We will have games, chores, and crafts that will take you from 1848 to 1981 in one trip. See how you do at rolling a hoop, put together a round of kick the can, and befriend your very own pet rock. Kids will get to make a special Mothers Day gift (but we won't ruin the surprise). For more information, e-mail caldrich@utah.gov. Antelope Island's famous cowboy poetry and western music gathering. Details and full schedule TBA. Presented by Friends of Antelope Island and Western Music Association. For more information, e-mail caldrich@utah.gov. Join park staff and members of Ogden Astronomical Society for a public star party in White Rock Bay. Solar viewing begins at 7:00 pm followed by deep space viewing after dark. Telescopes are provided by members of the astronomical society and will be focused on several deep space objects such as nebulae, star clusters and galaxies. Please ensure all flashlights have red filters. No reservation required. Park entrance fees apply. For more information, contact wendywilson@utah.gov. Join our FRIENDS at Great Salt Lake Audubon as they host the 2019 Audubon Photography Awards exhibit this May 28-June 11, 2019 at The City Library. More than 8,000 photos were entered into the National Audubon 9th annual contest. Come to see the 12 exceptional winning photographs that evoke the splendor, resilience, and ingenuity of bird life; on display on the lower level of The City Library. Please join us for a series of events that support this unique show. If you are a resident, trail user, auto-commuter, birder or other concerned citizen, please join us for an evening of discussion and idea-generation focused on protecting our beloved Legacy Parkway. Rep. Ballard suggested we gather for a follow-up to our January 16 Community Meeting to discuss what happened during the session, what was learned, and what options we still have going forward. Most importantly we will have small group discussion time to hear from YOU–our residents, commuters and trail users–about your real concerns about how Legacy Parkway will change on January 1, 2020 when the ban on heavy trucks expires. Let's fill the room again! One thing that Save Legacy Parkway committee members learned is that there are many opportunities for us to be informed and involved, and if state or local government does not do due diligence to protect and prepare residents for change, we need to speak up. We need commitments from leaders with regard to what action they will take to mitigate the negative impacts on communities and sensitive environmental areas around Legacy Parkway before January 1, 2020. Your voice matters, please make every effort to attend. Please join us on Friday, March 15th from 12:30-1:20 at Weber State University's Lindquist Hall LH Room 280 for the Great Salt Lake Science & Society Brown Bag Seminar Series, featuring Executive Director, Lynn de Freitas, who will speak on "The Great Salt Lake Geopolitical Landscape." Bring a lunch and join us for weekly seminars from regional experts and a field trip to Great Salt Lake. The Legislature required higher standards for Class V for good reason. The law has been in place over three decades to prevent Utah from becoming the nation’s “dumping ground” for solid waste. Utah already has nearly 2,000 years of Class V landfill capacity. There is no need to classify more Class V space based on Utah’s past experience that the approval of unnecessary landfills results in large unproductive areas and unfunded eyesores. The citizens of Utah have repeatedly made clear they do not want Utah to serve as the dumping ground for east and west-coast states with higher property values and lower willingness to process their own waste. It is not uncommon for unrealistic entrepreneurs to see big dollar signs in moving waste to Utah. But over the past several decades, these ventures have all come to nothing. (Solitude Landfill in Green River was granted Class V permit but was never able to get any waste contracts. PPL site has been trying to start a landfill since 2004 with no success). The Utah Legislature doesn’t enact laws to benefit a single company. Removing requirements for a Needs Assessment and weighing the environmental costs and benefits would change a well-functioning Utah law just to benefit a single company that can’t comply –Promontory Point Landfill. It’s prudent for the State and legislature to exercise oversight of inter-state commerce. It involves a larger policy question of how Utah wants to position itself—does Utah want to be seen as the world’s dump site or the world’s outdoor recreation mecca/tech leader/great place to do business? Inter-state commerce in waste involves supply-demand questions that should be weighed against the risks, especially with the Promontory Point Landfill on the shores of the Great Salt Lake. What effect would a Class V landfill have on existing businesses near the Lake like brine shrimpers and mineral harvesting, whose jobs and businesses depend upon the Lake’s ecosystem? Is there sufficient demand for more out-of-state Class V landfill capacity in Utah? We already have more than 2,000 years of capacity. Would building more benefit or harm the State? Are the risks worth it? Would the proposed Class V landfill really create more jobs, or just move jobs from one rural county to another? Solid waste isn’t solely a private-sector business industry. There are many business industries that the Utah Legislature has found need more oversight, such as alcohol, utilities, and tobacco and medical marijuana. Instead of creating new jobs it just moves them from one rural county to another. Class V landfills are often located in smaller rural communities and can provide desirable, higher-paying jobs. Because the amount of waste that can be profitably imported to Utah is essentially fixed, the laws of supply and demand mean that a new but unneeded Class V landfill will either fail or will take from existing in-state landfills rather than generating new waste sources. This would be devastating for small rural communities and provides no net benefit for the State as a whole. Small communities have out-sized reliance on existing Class V landfills, and profit reductions or closures could drive small cities into bankruptcy. The current Promontory Point Landfill situation shows that the Legislature required higher standards for Class V for good reason. Proven market – Promontory Point Landfill has been unable to secure a waste contract for two years and its fully constructed waste cell sits empty. Public benefits – Promontory Point Landfill would directly compete for work and income with a landfill in Carbon County, a county with one of the highest poverty rates and lowest employment levels in the State. Net beneficial environmental impact – Receiving waste that could include coal ash and other states’ hazardous wastes on the shores of the Great Salt Lake should be a non-starter. Serving industry within the State – Promontory Point Landfill’s extremely expensive but empty waste cell proves Utah doesn’t need the landfill. The Legislature shouldn’t compensate for the poor decision-making of a company. Promontory Point Landfill is not competing on the free market – it has received a huge tax-free municipal loan. Promontory Point Landfill has tried to skip, ignore, and change Utah’s regulatory process instead of complying. When this didn’t work, the Landfill threatened to sue the State. It is now trying to use the Legislature to make an end-run around Utah law. Promontory Point Landfill assumed high-risks by making massive expenditures before it secured a valid permit. No one is responsible to rescue Promontory Point Landfill from its own bad judgment and reckless expenditures. They knew the law and what the risks were when they decided to move ahead without the permits, demonstrations, and contracts that the current law requires. The Promontory Point Landfill has exhibited risky financial decision-making. They projected $13 Million in revenue in 2018 but have yet to receive a single piece of waste. In October 2017, Promontory Point Landfill received $16 Million in funds from a Box Elder County Municipal Bond, and have interest and principal payments of approximately $650,000 due every six months. Coincidentally, in November 2017, Promontory Point Landfill’s parent company, Allos Environmental, pledged $15 Million to the City of Atascadero in California for disaster cleanup, site closure and other contingencies. Facilitating a de facto Class V landfill for Promontory Point Landfill with a legislative work-around would reward their foolish decision to build the entire waste cell in such an ecologically vulnerable area with no waste contracts or final permits in place and compound the potential costs of failure or bankruptcy. Changing the law would eliminate important environmental and health protections. The Promontory Point Landfill site is located right on the shores of the Great Salt Lake, an environmentally significant and ecologically sensitive landmark that is a vital part of the State’s historical and economic life. This also puts the Landfill near the migratory paths and nests of millions of birds, which could feed on the waste, and then through defection, spread pollution into nearby fresh water sources, potentially leading to algal blooms. Many of the environmental and engineering tests for the Landfill were conducted by TetraTech, a company with an economic interest in the success of the landfill. The landfill is in an area that experiences high winds (often upwards of 70 mph), which could cause waste to escape and spread across the landscape. The landfill could also accept coal ash, which raises additional environmental concerns. The landfill is located near recognized fault lines and, if an earthquake hits, landfill liners could fail and pollute the environment, which is especially concerning being so near to the Great Salt Lake. The risk reward to Utah is NOT worth it. The Legislature has an oversight duty to the citizens and current viable and profitable industries in Utah. Changing the law would only benefit one company in the short-term while having long-lasting and wide-spread negative effects on several other companies established in reliance on the current law. A clean Great Salt Lake is a billion-dollar boon for Utah. Established local businesses such as brine shrimpers, ranchers, and mineral extractors employ hundreds of Utahns and depend on the Lake for their income. They and several Utah government agencies do not support the Landfill or these proposed changes because the extra pollution, degradation to the ecosystem, and traffic from the Landfill will damage businesses and future earning capabilities. The Landfill isn’t a local venture. The Landfill is owned by an east-coast company that has received a subsidized loan and said publicly it plans to ship in waste from as far away as the Appalachian Mountains. In November, a Delta Air Lines Boeing 767 carrying 223 passengers lifted off from Salt Lake City International Airport heading for Paris. But officials say six big tundra swans flew into it over the runway, crashing into its nose and engine covers. No birds survived, and the airport’s chief says it was “a very, very close call” for the jumbo jet. The birds “didn’t go straight into the engine, which is fortunate. Because at that elevation and that location, the potential for recovery is not great,” Bill Wyatt, executive director of the airport, told the Airport Advisory Board recently. The plane safely landed a few minutes later, and was grounded for inspection and repair. The Federal Aviation Administration reported nearly 14,500 bird strikes nationally in 2017. Those numbers led the agency to propose drastically increasing the area where all major airports must work to keep wildlife away from planes, expanding it from two miles to five beyond airport boundaries. 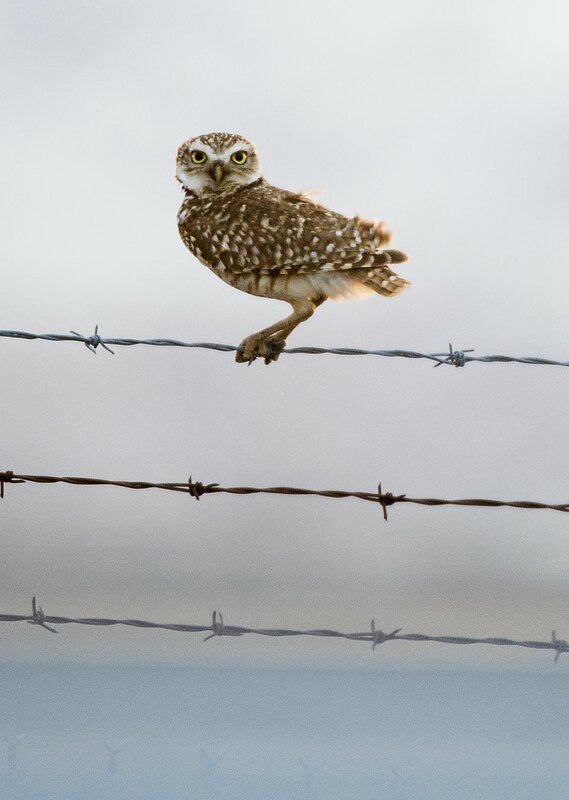 Leah Hogsten | The Salt Lake Tribune A Burrowing Owl rests on the fence surrounding the Salt Lake International Airport. The airport had 280 bird strikes in 2018. Most were minor, but overall they caused at least $674,892 in reported damage. There were 171 bird strikes with small song birds; 39 with waterfowl, 36 with raptors, 13 with bats and four with pigeons or doves. Another 17 strikes were with unknown types of birds. The FAA may yank federal funding from airports and their sponsors — such as Salt Lake City — that do not do everything in their power to limit new developments that could attract birds and other wildlife, including denying building permits. That proposed five-mile boundary includes much of Salt Lake City (to 1300 East on the east, plus all of its northwest quadrant out to the Kennecott tailings ponds). Envision Utah has been contracted to carry out "public engagement" for the Utah Inland Port. The initial public open houses listed below are the first two scheduled. Please note that Envision Utah is being paid $100,000 for this work labelled "public engagement", but which is likely to be a PR initiative designed to sell the public on the Port. There is also a survey that one can take. Go to https://www.utahinlandport.org/public-meetings. 2. It mentions nothing of the rushed and non-transparent way it (the Inland Port) was rushed thru the 2018 legislature (last 45 minutes for the legislature to read the bill! ), and what do you think about that..
A scientific paper, ""Using remote cameras to validate estimates of nest fate in shorebirds," by FRIEND, John Cavit, along with his student Kristen Ellis, and two other colleagues is one of three finalists for the best paper published in Ibis during 2018. FRIENDS of Great Salt Lake is seeking to hire an Environmental Education Coordinator. FRIENDS of Great Salt Lake (FRIENDS) was founded in 1994. The mission of FRIENDS is to preserve and protect Great Salt Lake ecosystems and to increase public awareness and appreciation of the Lake through education, research, advocacy, and the arts. The long-term vision of FRIENDS is to achieve comprehensive watershed-based restoration and protection for the Great Salt Lake Ecosystem. The Environmental Education Coordinator’s primary responsibility will be facilitating the 4th grade Lakeside Learning field trip program at Antelope Island State Park and Great Salt Lake Marina State Park. This position will also participate in community outreach events, administrative duties, and other tasks as assigned by the Education and Outreach Director. The Environmental Education Coordinator works with a diverse population of students, in groups of 25-50, in remote outdoor settings; it is essential that the Environmental Education Coordinator be comfortable working in various conditions (biting insects, salt, sand, rain, sun) outdoors and be adaptable in the case of inclement weather. Lakeside Learning field trips take place Monday through Friday, between 8am and 2pm during the months of April, May, June, September, and October at Antelope Island State Park and Great Salt Lake Marina State Park. Additional work will generally take place during business hours, Monday through Friday, although some evening and weekends may be required. Although this position will average 20-25 hours per week, the weekly time commitment will be variable. Lead groups of 4th graders through a series of outdoor educational activities at Antelope Island State Park and Great Salt Lake Marina State Park. Email a resume, cover letter, and 3 references to Holly Simonsen at snowyegret@fogsl.org no later than Friday March 1, 2019. Join FRIENDS of Great Salt Lake and Save Legacy Parkway on Thursday, February 7 from 4:00-5:00 PM at Utah State Capitol East Senate Building Room 215 as we rally support to extend the Legacy Parkway Truck Ban. Community organizers suggest we wear yellow to visibly show our support of the bill. Click here for more informaton. At the forefront of this discussion is a resolution championed by Sen. Jani Iwamoto, D-Holladay, to promote “water banking,” a program that enables growers to pause their water use without risk of forfeiting their right to the water. With agriculture accounting for 80 percent of use, banking could go along way to solving the state’s water woes.